Join Chicago Foundation for Women and the Asset Funders Network Chicago for a presentation of the findings from Community Organizing and Family Issues’ report, “Stopping the Debt Spiral,” and a discussion about how fines and fees increase debt and inequality.​ National research reveals that more than $50 billion in debt from fines and fees is currently being held by approximately 10 million people because of their involvement in the criminal justice system, which does not even scratch the surface of the debt and asset erosion​ from all public and private fines and fees. ​Here in Illinois, POWER-PAC Illinois mothers and grandmothers surveyed over 300 parents and discovered that nearly 60% of respondents live on less than $15,000 a year. 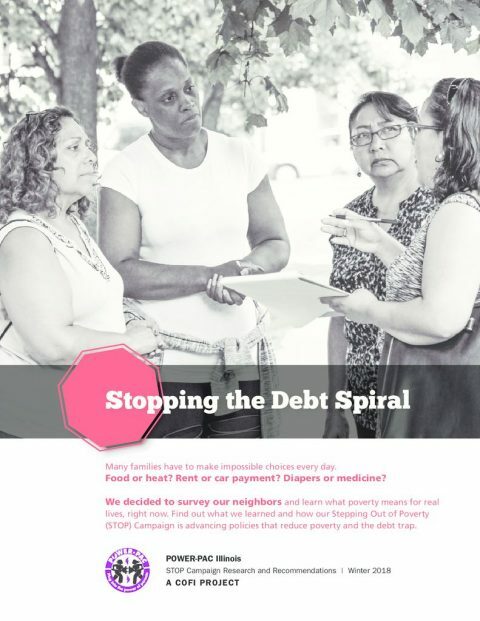 Their new report, Stopping the Debt Spiral, highlights how debt traps low-income families in poverty and shares POWER-PAC Illinois’ recommendations to reduce poverty and this debt trap.